Click the arrows to scroll left/right and find out who offers Deal or No Deal online. Just like the real thing, online gamers can now play Deal Or No Deal at various online gaming sites. The actual game play varies a bit by where you play. 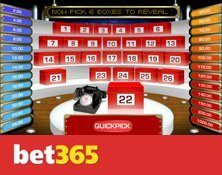 Variants range from Deal or No Deal Slots, to Deal or No Deal quick play games that have the same features as the real game, to incredibly realistic Deal Or No Deal games that actually compare to the real TV game show. 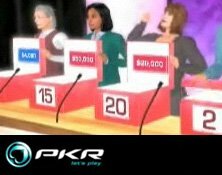 The 3D version of online Deal or No Deal is generally preferred by eye-candy lovers, for it is developed to mimic the game all the way down to the actual host of the UK TV show, Noel Edmonds. Whether you simply enjoy playing Deal or No Deal for the fun of it, or want to play for real money, online Deal or No Deal aims to please. You can Deal or No Deal online for real money, with stakes of $0.50 up to $100. The more you stake, the higher the suitcase amounts will be, and of course the higher the potential winnings become. 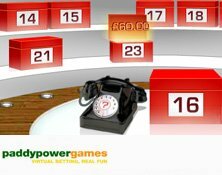 Just like the in the TV version, online Deal or No Deal gives the player 26 cases to choose from. Select your case and start working your way down through the cases. Each case you choose to open will have a cash amount equal to one of the cash amounts on the board. The amount revealed in each chosen case will then be removed from the board, and you'll get a phone call from the banker offering you a deal. You can take the deal and keep the cash, or click “No Deal” to keep playing. You want to have as many high cash amounts on the board as possible, eliminating cases with smaller cash amounts. You'll get a better deal from the banker this way. The 3D graphics are simply amazing. You won't believe how close the online 3D version of Deal or No Deal is to the actual UK television game show. The price for viewing such incredible graphics isn't cheap of course. You'll need a pretty fast computer with a broadband connection to keep up with the resource hog. However, if you have a capable computer, it's well worth the visual quality to play the 3D version of Deal or No Deal online.